I met Terri at 1pm at THEHotel valet after we checked out and she drove us to Palazzo where I quickly checked in at the VIP desk which as usual didn't have a line. We hadn't eaten yet and were planning on eating at Grand Lux when I received a text from Huddler that him and Brian were having a bite at Dos Caminos. I know plenty of people who love the food at Dos Caminos but Terri and I weren't in the mood for Mexican so we walked into the restaurant, looked around and didn't spot Huddler and Brian and I was texting back asking them where they were when they waved from the bar. A few minutes later Erin joined us too, and so we left Dos Caminos and went to the Platinum lounge at Palazzo where some of us had cappuccino's. I asked our server if they had any chocolate croissants and he went into a back room and came out with a plateful, way too many for us to finish so next time I guess I better specify just a couple. We had fun chatting with Erin, Huddler and Brian, so much fun I forgot to take any photos. The photo above of the cappuccino is from later in the trip. After they left to return to Aria and NYNY, Terri and I decided it was too late to eat at Grand Lux or anywhere else since we had to leave in a few hours for our dinner at Cosmopolitan's, E at Jaleo. 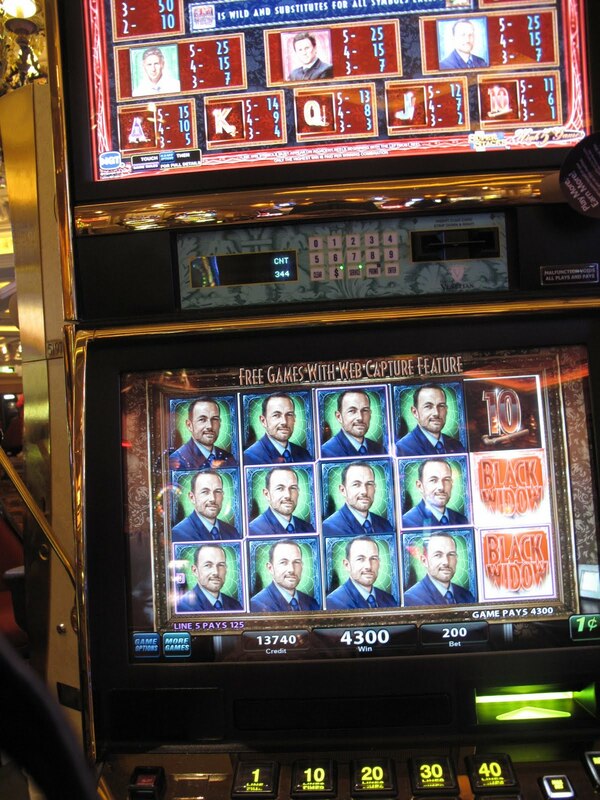 So of course we decided to try our luck with the slots. Terri stayed at Palazzo while I immediately headed over to the high limit lounge at Venetian to try the only $1 Da Vinci slot there and quickly got a win for $260.00, but DaVinci started to act coldly toward me so I left the high limit room. 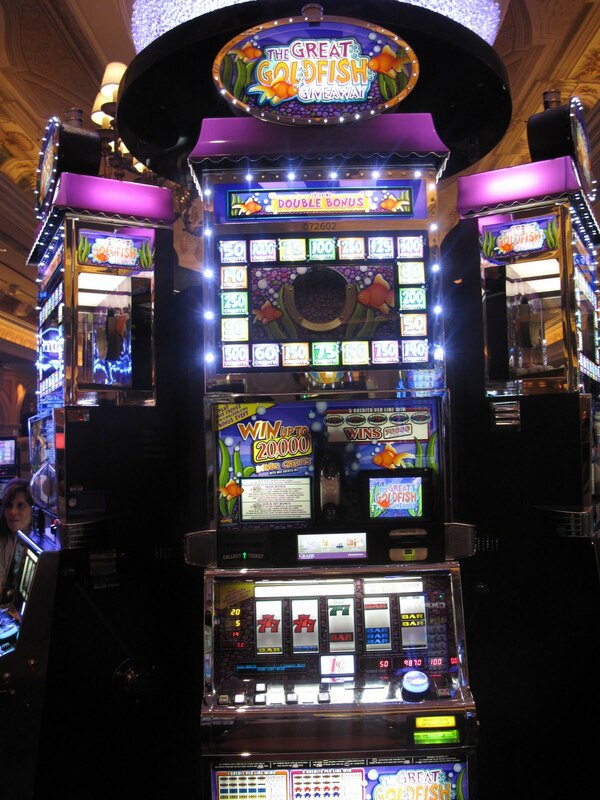 I next found the Great Goldfish slot that has a max bet of $1.50 and briefly played it, but nothing much was happening with it so I grew bored. These slot acts a bit similar in my opinion to the Mummy slots. Someone else might love this new slot, I have to admit that the only Gold Fish slot I love is the original and I've tried very hard to love Goldfish 2 and Race for the Gold. Nearby was a Black Widow slot so I tried that for a few minutes and hit what looked to me like it should have been a great win, but was only $43.00 on a $2 bet. Moving on I saw a bank of 3 Hangover slots across from Venetian's, Grand Lux Restaurant and one seat was empty! Max bet on this version of Hangover was $6, so I slipped a hundred into it but recalling how fast the Hangover slots at Bellagio the previous day had sucked my money down I decided to try $4 a spin for $1 a spin a game. I must have discovered the lucky Hangover slot in this bank or the force was with me, oops wrong game, but I started to get lots of bonuses and even a lousy picker like myself can win money during bonuses if they are coming around enough. The link above takes you to the place on this blog where I posted some of the videos of my bonuses during 90 minutes of luck on Hangover. By the time I needed to get ready for dinner, I was up almost $500 from the $100 I stared out with. Tonight was our special dinner at Cosmopolitan's, E at Jaleo and our friend Claire who had arranged the dinner had arrived earlier that day and was staying at Mandarin Oriental. We were told by E to get there 15 minutes early and my husband's flight wasn't arriving until 4:15pm so Terri and I were waiting impatiently at Palazzo at this point for Randy to arrive. Thankfully the limo that Palazzo sent for him which is complimentary due to being Platinum level was quick and dropped him off at 4:30pm. I barely gave him time to put his luggage in our suite before Terri drove us all to Cosmopolitan. Randy had declined eating with us for this special tasting due to his concerns about his flight possibly being late and their rules saying they wouldn't seat latecomers, but I strongly suspect he thought the menu was a bit too adventuresome for him so his plan was to eat dinner at Holstein's and gamble. I hope you glanced at the photographs in the above review because this was a wonderful dinner if you are adventuresome or a foodie. Even if you aren't, some of the food is interesting to look at. For those of you who don't want to read the review, above is the bar the eight of us sat around and the chefs that prepared the courses. We were due now for a Meet of people from three Las Vegas message boards (rexers, vegasmessage board and blonde4ever with some of us also on TA) at Aria's City Bar. Terri drove us to Aria and during the drive I was happy to learn that Randy had a lot of luck at Cosmo on my favorite $1 DaVinci machines, the same one that I had hit the jackpot of $5,000 on last March and won a hand pay of $1280.00 on it. We were now ahead for the trip as Randy's win and my earlier luck on Hangover had more then wiped out the $900 loss I left THEHotel with. At City Bar at Aria, there were already some people there when we arrived. That's Bob (imokbob, blonde4ever message board with Maureen (vegasrex) and her husband Brian. Above, my husband Randy wearing the glasses and Kevin (Kydds from vegasrex & Blonde's board). Below Terri and Claire (both from Blonde's board) and Kevin again. Erin (vegasrex) and one of her friends was also there and Kathy (blonde's board) joined us shortly after these photos were taken and I seem to have missed taking a photo of them. Huddler and Brian swung by and disappeared likely to one of the tables to gamble. I was hoping to meet Beejay, Macker and Alexanbo (vegasmessage board and others) who were suppose to be coming to the meet, but unfortunately they were late by a hour so while Terri and Claire were there when they arrived, we had already left. Randy felt he was on a lucky streak and wanted to return back to Palazzo. Since I had wanted to stay a bit longer at the Meet it was a good thing for Randy that his luck did continue and he hit for $670.00 on the $1 DaVinci Diamonds at Venetian. 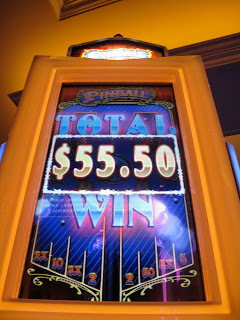 We then tried the $5 Pinball and won $570.00 on it so we're now about $1000 ahead for the trip. This tempted me play the $1 Cleopatra at Venetian, and fortunately I got lucky too and hit a bonus for $820.00. 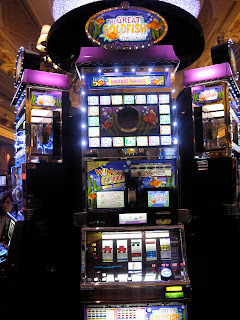 After the luck with Cleo, we try some $5 Wheel of Fortune and a couple other slots in the Venetian HL room but no luck. Time to leave because our ticket is now down to about $1600.00. Oops, we are walking past the $1 Wolf Run, the slot Randy loves but we seldom try because at $40 a minimum spin it's a real bank roll killer. However Randy is still feeling lucky and while I have visions of our nice plump ticket disappearing quickly, he promises to only do 3 or 4 spins. Randy was right his luck was still there and on the third spin he got a hit for $440.00 so we cashed out and ran out of the high limit room back to our comfort zone of the penny and five cent slots. We decide to give Star Trek Battlestations a try because it was lucky for us back in July. First we cashed in our ticket, it was too large at this point to risk leaving in a slot for someone to hit the cash out button and take off with it or for us to forget to take it. 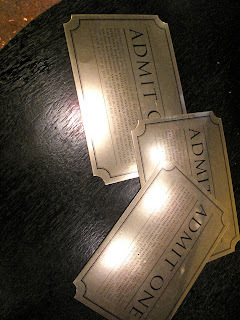 Don't laugh, but there's been a couple times when Randy and I have cashed out and thought the other one grabbed the ticket to discover neither one of us had it! We had some brief fun with Star Trek but then it just started to eat our money so we left. As we were leaving that area I spied the new IGT Ringling Brother's, Barnum & Bailey slot. We played Ringling Brothers for about 5 minutes and then hit the bonus which paid $118.00. Below is the video of that bonus. This slot was fun but for some reason we never went back to it again this trip, but I will try it again at some point. We played a few more penny and five cent slots but started losing and around this time Randy developed a headache so he went back to our room at Palazzo to lay down. I continued to play the penny slots but was mainly losing. I did get a nice win of $243.15 on the new WMS Alice in Wonderland Mad Tea Party slot that I liked last trip at Palazzo and I was betting $1.50 a push. I usually lose on the Monopoly games and seldom play them any longer. However at Venetian I found one that was new to me, Monopoly Around The World and for once I had a bit of luck on it and hit some chance wilds for $115.00. That was it for my wins after Randy went back to our room, I just continued to lose on everything I tried, Wolf Run, Goldfish, Treasures of Troy, you name it. When I went to bed that night we were still ahead but not for my lack of trying to lose our winnings. Below is the view from our suite, the typical one we get of Treasure Island. The next morning err excuse me afternoon since we slept in late, we ate at Grand Lux, the usually egg sandwich for Randy and the Manhattan chopped salad for me with shrimp and chicken. I've posted photos of these before so I'm skipping them this time. Randy still had his headache so I encouraged him to schedule a massage at Canyon Ranch Spa, not that he needed much encouragement. We didn't meet up with anyone today as quite a few people were leaving to return home and Claire and Terri were eating at Bradley Ogden tonight and then seeing the Rod Stewart show. Randy and I had seen Rod Stewart in concert a couple years ago so decided to skip it this time. While Randy was having his massage, I was gambling and while I didn't get any big wins, I wasn't losing money which was fun. I decided to play Hexbreaker 2 at Palazzo since it had been lucky for me at Mandalay Bay. I was excited when I hit the bonus and then disappointed when it only paid $33.00 on a $5.00 bet. Fortunately the next spin after that bonus also hit the bonus and that time it paid $266.00. A big disappointment to me this trip is they have removed the Showgirls slot from both Palazzo and Venetian. That penny slot was capable of big pay offs so I'm supposed that's why they are now MIA (sigh). I briefly played instead Lord of the Rings at Palazzo and had 3 wilds for $101.00. I had some modest luck on Treasures of Troy at $4 a push. Same thing with penny Wolf Run, I was staying ahead but no big wins. Randy was now done with his massage and had tried a few slots with about the same results as me, staying ahead with modest wins, which of course is always better then losing. 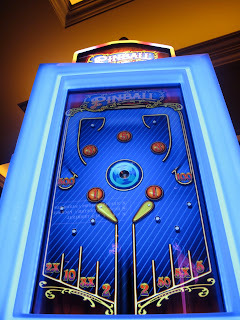 I took a break around this time to get ready for dinner and then it was time for dinner at Tao, but first a stop at the Venetian High Limit room where $5 Pinball briefly decided to cooperate for a win of $425.00. We also tried the $5, Wheel of Fortune after Pinball and lost a couple hundred on it so decided we better toddle off to our dinner at Tao. The restaurants at both Venetian and Palazzo this trip were packed due to hosting two conventions so it was with some dismay that I discovered that Tao somehow didn't have my opentable reservation, likely due to a silly error on my part. While the hostess was checking around for it, she did a search on my name and brought up the previous times we had eaten there and when she read we were a regular customer she was nice enough to seat us at the booth we had last time and didn't make us wait even though they had a line waiting. Our favorite drink at Tao is called the Phuket and is a spicy drink with tequila, thai chili's and cucumbers, but even though we had just had it in July it had since been removed from the drink menu. We got lucky though because our server talked to the bartender and they were happy to make it for us so I ordered two err make that three during dinner. On our server's recommendation we started out with the lobster and shrimp spring roll with pineapple sauce which was yummy and in the above photo. I hardly ever order soup but tonight due to a scratchy throat that was slowly getting worse I ordered spicy thai dumpling soup which I really liked a lot. Randy ordered the hot and sour soup with shrimp toast which is pictured above. I can't seem to locate a photo of my soup. Darn cocktails must have already made me ditzy. Randy and I both ordered the miso glazed sea bass with wok vegetables, it's this entree that continues to draw us back to eating at Tao on a regular basis, it is truly one of the best seafood entrees I have eaten. We also had a side of tempura vegetables which were good but at this point likely due to the soup being filling and one dish too much, we were really full. Normally we share one of Tao's desserts because they are wonderful but tonight we had to skip it. I'm tipsy now thanks to my 3 spicy drinks and being a lightweight drinker, so it's time for me to take a tipsy stumble around Venetian and Palazzo taking photos as I go. The Buddhist monks seemed impressed with the gondola area of Venetian and were busy taking their own photos. I have no idea why I took the photograph below, if you have any guesses please let me know! Yes, I know we have all seen the gondola area, but hey I was there and I didn't fall in the water! The view of the Palazzo fountain area from the second story. Admiring the shiny money that people throw out on the top of the Palazzo waterfall. Okay, now I'm just snapping photos of anything to annoy Randy who is ready to gamble some more. It's about this time that Randy decides to take me into the Palazzo Platinum lounge for some coffee where he suggests enough with the photos. While there I take a photograph of some of the food sitting out because you can't have too many photos. Okay, perhaps you can, but the coffee really wasn't kicking in yet. We exit the platinum lounge and Randy decides to sit me at the Goldfish slot until the coffee kicks in a bit. Lately Goldfish hasn't shown me much love, but I did have one good hit on it. We decide to keep pushing our luck and get another hit for $530.00. Again we push our luck and get a hit for $760.00 and finally below we get another hit of $100 before deciding DaVinci is tired and needs a rest. It's time to visit the penny slots and the Hangover slot I won at the previous day is open so we play it for a while but bonuses aren't coming as quickly, though we did have a few wins like above. After trying some more penny slots but not having a lot of luck we go say goodnight to our $1 DaVinci Diamonds by losing $400 to it. Oh well, we can't complain as it has given more then it has taken. We decide to call it a night and walk back to Palazzo where I take some photos of the flowers around the waterfall area. On the way back to the room, taking a circuitous route, we find ourselves back to HexBreaker 2 where a bonus donates $266.00 to our winnings for the evening. Another bonus quickly follows for $120.50 and we decide to take our winnings and go to sleep. We slept in late but made our 12:30pm reservation for lunch at Delmonico's. It was the first day of restaurant week and we ordered from their prix fix menu because a portion of the price of the meal is donated to Three Square Food Bank. I started with the gumbo which was perfect for my throat which was even feeling scratchier then the day before. They have a cute presentation where they pour the gumbo out of a small metal pan and onto the rice. Randy started with the Caesar salad which he said was excellent. We both had the BBQ Shrimp with rosemary biscuit and I loved mine. Randy thought this shrimp were a bit off, but I think it was his imagination because when I took a taste of his they tasted fine to me and he never had any stomach problems after this lunch. We both ordered Emeril's banana creme pie and it was fabulous. However, it's here I started to suspect my scratchy throat was not the Vegas air but I was catching something because I couldn't eat much of it and that's not like this dessert lover. Shortly after meeting up with Claire we had a short meet with Vegasgrannie (trip advisor) and her friend Nancy at the Venetian Gold Lounge which we enjoyed, however I forgot to take any photos! After Vegasgrannie and friend left to go to Wynn, Claire had to leave too to meet friends at the Sugar Factory so of course Randy and I decided to see if our luck was going to continue since we were up about $1500.00 at this point. Today we noticed that Venetian had the new Pinball slot installed. I had been looking forward to this slot after reading about the graphics and music, Pinball Wizard by the Who. The graphics were good, the music was a nice addition, the game was not really a improvement in my opinion, at least as far as pay outs are concerned. I don't think we'll be playing the new Pinball much if at all. In my opinion like Goldfish sometimes the original is better. We followed Pinball with some fun on the Venetian Hangover slot. Our luck today wasn't as bad as our luck on the July trip, so we continued to play since we were ahead. We paid a brief visit to the $1 DaVinci Diamonds at Venetian, but that ATM had closed down for us. We briefly tried the $5 WOF, Pinball and Top Dollar and our winnings were disappearing fast. It was time to return to the penny and 5 cent slots and hope for a lot of luck. I decided to try the Monopoly Around the World slot again and had some brief luck with it before we went back to Palazzo to gamble. Had a brief fling with Alice and her Mad Tea Party, but Wolf Run, and other favorite slots were not going well. Also, a big disappointment for this trip is that the Kitty Glitter slots at both Palazzo and Venetian seemed to have been removed. We looked all over for them and couldn't find them. Since the old favorites were letting us down we tried some new slots like Bombshells which was cute with the pin up girls, however our winnings were disappearing quickly. It was time to go to dinner at Cut and hope that our luck would improve after dinner. We were seated at one of our favorite booths and had a good view of most of the restaurant. About 30 minutes into our dinner Cut was completely full, mainly of conventioneers and there was a lot of people waiting for a table. Above are the tasty parmesan breadsticks. We also selected pretzel bread and focaccia. The amuse was a type of cheese puff. Randy ordered the butter lettuce salad that had avocado, blue cheese and a champagne herb vinaigrette dressing. I had a great heirloom tomato salad with goat cheese, in a tuscan olive oil dressing. Condiments they provide with your entrees. Plus we ordered the house steak sauce which I love and also a green peppercorn cognac sauce. We both ordered the petite filet mignon which is always delicious at Cut. The Nantes carrots with artichokes and rosemary were a great side. We almost always finish by sharing the Cut chocolate souffle with creme fraiche and Gianduja chocolate ice cream, though this trip Randy got most of it because I was definitely starting to feel the virus I ended up catching. After dinner Randy too this boring photo of me. I think I should have posed like this lady instead. I thought the summer Palazzo flower display was exceptionally pretty this time. From a different angle that shows the animated frog they had. I would like to say our luck changed after dinner but it didn't, we continued to play and while we got some modest wins like this one on 5 cent Witches Riches, we slowly continued to lose on the penny and five cent slots, until we lost our winnings and a thousand of our own money. Without a doubt it would have been better to have not given them any of our own money this trip but we kept thinking we only need one big hit again or run of luck to get it all back and more and since we were still having fun we continued to play. So unlike March we didn't go home with more money then we came with, but unlike July we didn't lose more money then a non-gambling vacation would have cost us. In fact for 5 days we ate at great restaurants, I saw a terrific show with Terri, stayed in beautiful hotels, had fun on the slots, met up with friends and it cost us less then if we had not gambled and paid for it instead of being comped, so it was a good trip price wise for us. The next morning after breakfast at Grand Lux, we quickly checked out, had the limo back to the airport and a smooth flight home with the exception the plane trip made my cold/virus worse. While I found myself sick for about 5 days, poor Terri had also caught it (likely we were exposed at Mandalay Bay to something) and was even sicker then me. My next trip Randy has to stay home due to his work schedule, poor guy, but I'll be back in Vegas on October 5th to attend G2E, staying at Encore for 2 nights and then I'll be staying over for a 3 nights at a casino still to be decided. I have quite a few friends visiting Las Vegas during that time, including some friends from where we live, so it's sure to be a fun trip regardless of any gambling ups and downs. Great report Diana. I played the Ringling Bros last week and had no luck on it. Aslo a lot of Hangover. The $6 bet is a bummer. Really like the $3 with 2 tries at the bonuses. I love your report. So fun with lots of food pictures and honest reporting. Thanks so much for posting. I will be at LV this wknd and got lots of idea from your postings.